Our siding products are known and respected throughout the industry. We offer products from manufactures such as LP Smartside, Nichiha, Cedar Valley, Shakertown, James Hardie, Boral, Miratec and Allura. 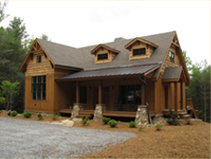 We are also a trusted source for quality western red cedar siding and trim. Other wood options include pine, cypress, and redwood in multiple styles like lap, channel, tongue and groove and wavy edge. A wide variety of interior paneling, moldings, and trim in a multitude of finishes and colors are also available.